Sessa finally shows the second model of its flybridge range with the much awaited 45 Fly. The second Sessa flybridge model follows the first 54 Fly, and was launched in middle Summer with a tour taking it around the West Mediterranean and finishing in early September in Cannes for the World preview at the famous boat show. The Sessa 45 Fly comes again from the hands of architect Christian Grande who presented very modern sports flybridge looks, or as Sessa likes to call it an open evolution. Innovative ideas come from the forward sunbed on the flybridge which has a movable back rest which can extend its size, and from the two pillars of the aft deck which have an open tent cover privatizing the area or protect it from cold weather in seconds. The 45 Fly is a tribute to clever design and intelligent use of space from a very spacious flybridge seating up to ten persons, to a layout design of the interior offered in a two, or three cabins plan. In the three cabins version the galley moves up in a split level saloon, while in the two sleeping room offer this is below and is a spacious offer. In both layouts the owners room is to fore, and features an island double with a private shower head to port side. 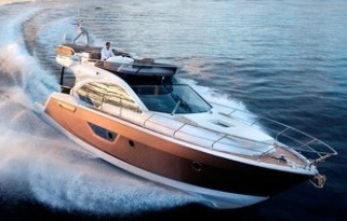 Power from the Sessa 45 Fly is from Volvo 435hp engines with IPS pods.